In 2010 on my way home from Guyana, South America I made a stop over in Trinidad & Tobago. After volunteering in a remote village in Guyana for three weeks, I thought I should reward myself with some much deserved R & R. Tobago is my favorite of the two islands. It is much smaller with a very relaxed atmosphere. Although Tobago is small, it is the perfect destination for relaxation and tranquility or adventure (including ecotourism). During my stay, I rented a four by four and drove around the entire Island taking in all of the sights (it was my first time driving on the left side of the road!). I enjoyed learning about the history of Christopher Columbus in Tobago, tasting the Caribbean flavours in Scarborough, and snorkeling in one of the Caribbean’s best diving sites. 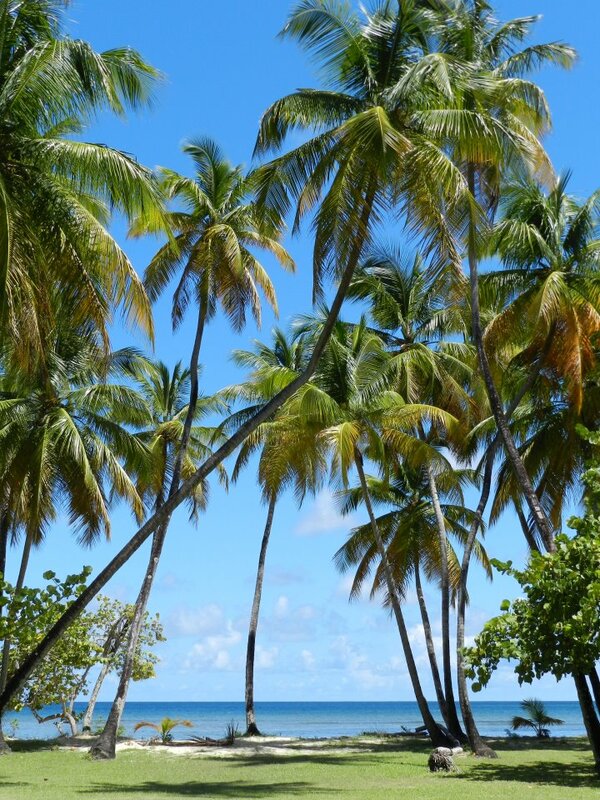 Did you know that the island of Tobago is considered the island that possibly inspired the story Robinson Crusoe? As you know, I love the beach so my favorite part was soaking up the sun at Pigeon Point and Englishman’s Bay. Englishman’s Bay is a secluded beach where few tourists venture and is considered Tobago’s most beautiful beach… where the sand and turquoise waters meet the rain forest. The sounds of tropical birds singing from a distance made me feel like I was in a dream. According to the Telegraph Englishman’s Bay is one of the world’s most beautiful beaches. Will you be visiting there? Below is one of my favorite pictures at Pigeon Point Heritage Park during my stay on the island. This entry was posted in Caribbean, Trinidad & Tabago, Turquoise Travel and tagged Beach, bucketlist, Caribbean, Travel, Trinidad and Tobago, Turquoise Compass by Turquoise Compass. Bookmark the permalink. Your travels are bringing up old memories 🙂 When I was in high school in Guyana our folk group made a trip to Trinidad and Tobago to perform. I was about 16 at the time. It took us about 45 minutes to fly there and we had a ball. We took a ferry over to Tobago and, I agree with you, that was my favorite of the two islands. Oh wow, that sounds like an incredible time for a young girl in high school! I think it is so important for us to experience different cultures and to travel to learn more about the world and ourselves. I didn’t end up taking the ferry, but flew over instead. The flight was literally 15 minutes. Do you think you will take your husband there? That would be amazing for you guys! I’m more of a traveler than my guy as well! I think it is good though because he gounds me! It is a good balance (like you said)…or I would be on the go all the time. Great minds think alike (you and I). I am so glad you are enjoying my blog! I appreciate and love all the comments! Keep them coming! Loving your posts as well!